Precise and stable clamping of small workpieces in the sub-spindles of sliding head machines has long been an issue for turned part manufacturers. Floyd have pioneered many solutions in this area, but this latest development in association with MASA tools, California, is about to revolutionise our understanding of precision workholding. To truly understand the revolution that is Microconic, consider that only three things are in physical contact with the workpiece when it is being made: The cutting tool, coolant/cutting fluid, and the workholding. Only the workholding portion has remained virtually unchanged since it was originally invented almost 100 years ago. The limitations of traditional collet systems are so firmly ingrained in the experience of most machinists that they consider them as part of the process rather than an obstacle. Every force applied by every cutting tool must be accurately countered by the workholding. The Microconic system is inherently so much better than traditional systems, that it ultimately allows rethinking of what is possible, often resulting in large gains in productivity. This remarkable new Microconic workholding system consists of a cartridge and precision collet. The collet fits inside the cartridge and accurately adjusted before it is fitted directly into the existing collet sleeve no machine adaptations are required. The collets are available with clamping diameters from 0.2mm to 10mm, meaning the most fragile of parts can be clamped with safely and with precision. With a concentricity level between 3 to 5 microns, the Masa Microconic System is ideal for Sliding head lathes like Tornos, Citizen, Star etc. Currently available for F20 and F25 style collets with F37 versions in development. A 5C version is also available. The new Microconic cartridge system from Floyd Automatic incorporates a solid extended nose that is extremely rigid and robust for impeccable precision, repeatability and concentricity. Uniquely, the new device has the facility for micron-adjustment of the collet closure, ensuring that even the most fragile of components can be securely clamped. To confirm precision levels, the hardened and ground cartridges can be used as gauges to verify machine spindle accuracy. The Microconic system also includes ‘over clamping’ collets. (i.e. to clamp behind a shoulder). The cartridge/collet combination can accommodate openings (depending on the application) beyond 4mm larger than the clamping diameter. This flexibility can give the production engineer the possibility machine the part the other way around which can often help improve cycle times significantly. As the most accurate workholding collets for the micro-machining industry, the Masa Microconic collets are available in 0.05mm increments from 0.22mm up to 10mm diameter. 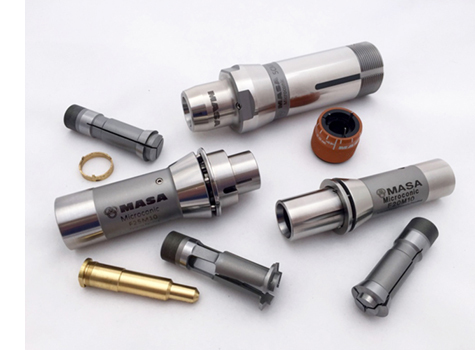 Each collet has a nominal clamping range from 0.05 to 0.1mm depending upon the chosen collet diameter. With regard to the over-grip collets, the nominal clamping diameter starts at 0.5mm with a maximum clamping diameter of 7.20mm. Fatigue tested to over 250,000 full-load cycles, the over-grip collets include a part-ejection guide sleeve blank. For more details on this exciting new development for small part clamping, please contact us.